You've found the “U.S. Barbados Blackbelly Sheep Breeders” page here at Hobby Farm Wisdom! If this is the first time you have visited our site: Welcome! Orignating in Barbados, the Blackbelly sheep are a hair sheep. These animals are heat resistant being adapted to hot, humid environments but they can also do well in the cold. They reproduce year-round and the ewes are very fertile. Barbados Blackbelly sheep are hardy animals that can survive rough forage, parasites and diseases. They have a reddish-brown or tan body with a black underbelly and legs, with black facial bars. 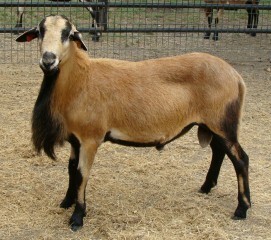 Rams have thick manes covering the neck and shoulders. Their ears are pointy and both sexes are polled. These sheep grow slowly and ewes weigh between 85-100 lbs and rams 100-130 lbs. They have a docile temper, need no shearing and are used for a variety of purposes: meat (mild flavored and low in fat), pasture improvement, brush control, breeding stock, hobby livestock, upgrade programs, etc.